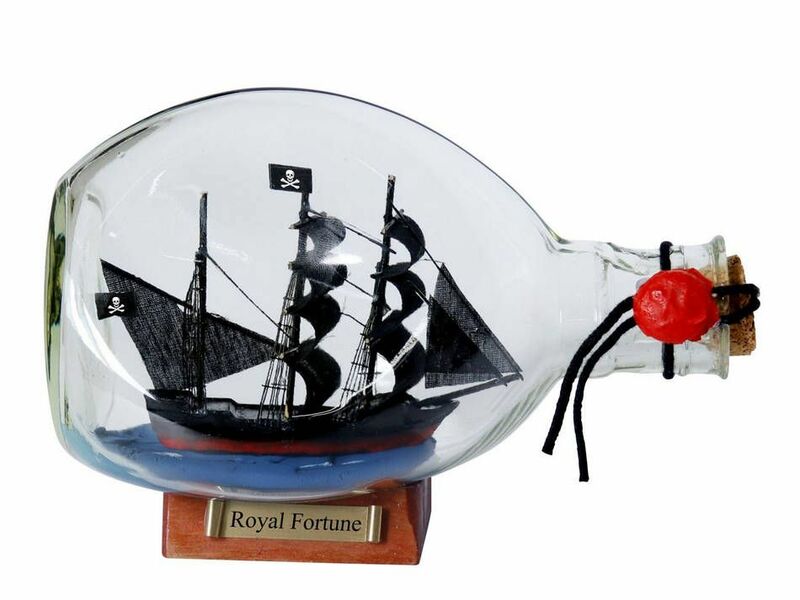 Black Bart's Royal Fortune Pirate Ship in a Bottle 7"
The legendary ship of the fierce pirate known as Black Bart, the Royal Fortune tells a swashbuckling story through historic design. 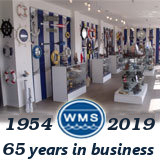 Place this ship in a bottle on the shelf, atop the mantel, or on any desk in the home or office, and enjoy the fascinating nautical world of pirate lore. In June 1720, Roberts wreaked havok along the Newfoundland coast capturing 26 sloops and 150 fishing boats, as well as destroying sheds and machinery along the shore. Roberts seized an 18 gun galley and traded her for a 28 gun French ship, renaming her the "Royal Fortune". Roberts sailed south and plundered at least a dozen English merchantmen. Roberts is reputed to have tortured and killed French prisoners. In September 1720, Roberts reached the West Indies where he attacked the harbor at Saint Kitts. He seized one ship and burned two others. Roberts sailed out of the harbor only to return the next day, whereby he was driven away by cannon fire. Roberts repaired his ships at Saint Bartholomew, then in October he returned to Saint Kitts to attack. Roberts plundered 15 French and English ships there. By January, Roberts had added a 32 gun Dutch slaver which he used to trick the inhabitants of Martinique. Roberts sailed the ship past the harbors of Martinique signalling the Frenchmen to visit Saint Lucia, telling them of a profit to be made buying slaves there. Roberts waited for his prey at Saint Lucia and seized and destroyed 14 French ships. The French prisoners were severely tortured and some were killed. The "Fortune" was replaced by an 18 gun brigantine renamed the "Good Fortune". Roberts next captured a French man-of-war which had as one of her passengers the governor of Martinique. The governor was hanged and the ship which sported 52 guns was renamed the "Royal Fortune". Roberts had at this time 3 ships in his fleet, the "Fortune","Good Fortune", and the "Royal Fortune". Roberts had nearly single handedly halted shipping to and from the Spanish Main, having lasted over a year in the Navy infested waters of the Caribbean. At this time he returned across the Atlantic to sell his stolen wares, and to plunder the African coast. By April 1721, Roberts had become more tyrannical over his crew. On the way to Africa the "Good Fortune" was stolen by Thomas Anstis who had been given command of her. In June, Roberts arrived at Africa where he captured 4 ships keeping one and renaming her the "Ranger". Roberts then sailed to Liberia where he captured the Royal Africa Company's ship the "Onslow". The ship had cargo worth £ 9,000 and it replaced his ship the "Royal Fortune". His next stop was the Ivory Coast where he took at least 6 prizes. January 11th, 1722, Roberts reached Whydah and captured 11 slave ships which were ransomed for 8 pounds of gold dust each. When one of the captains refused to pay, his ship was burned along with it's cargo of 80 slaves. By now he had added another ship, a 32 gun French warship renamed the "Great Ranger". Roberts had become a serious threat to the British trading companies and as such pirate hunters were pursuing him. On February 5th, a British man-of-war, the "Swallow" captained by Challoner Ogle caught up with Roberts near Cape Lopez in Gabon. Some say Roberts mistook the "Swallow" as a Portuguese trader and closed to fight her. Others say Ogle found the "Royal Fortune" at anchor with most of Roberts' crew drunk or hung over after celebrating the taking of a prize the previous night. And Roberts took the "Royal Fortune" toward the "Swallow" hoping to escape with the help of the wind. In either case once in range Ogle sent a bombardment of cannon fire to the pirates and immediately Roberts' men responded in kind. When the smoke cleared, the crew saw that Bartholomew Roberts was slumped over a cannon and had been killed in the first and only barrage.